It is truly well worth the effort. You can get tailor made pizzas this way. There were three of us so we divided the dough and piled on our tasty treats. 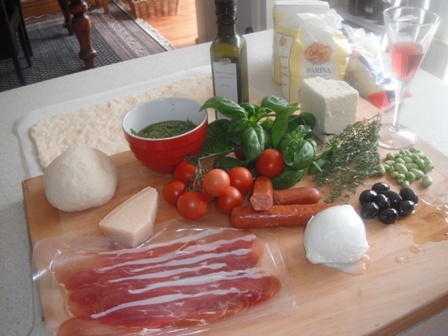 The dough was particularly nice – I had some Italian flour grade 00 for making pasta and I used it for the pizza base. Combine: 2 cups flour, 2 t sugar, 1/2 t salt, 1 t dried yeast 1 T olive oil, and 1 cup of warm water. Mix together then knead for about 5 minutes. Put in an oiled bowl, cover and wait until it doubles in size. Knock it down and knead it some more. This is better than going to the gym. Stetch it to the desired shape. Because three of us were sharing it, we made an oblong shape so it was easy to divide and cut. I put EVERYTHING on mine. Others with more delicate palates were more refined. We had it with Rose – of course! Buonissimo! So we did! Didn't realise you were publishing – fantastic! next, the pool pics?